I'm a London-based, full stack web developer. I'm a junior developer with a keen eye for design. Since December 2014, I have been working at Beamly (formerly Zeebox), as a member of the web team. I recently graduated from the General Assembly web development immersive course: 12 weeks of coding all day, every day. With nine years of agency experience as a financial communications professional, I recognise the importance of delivering projects on time and on budget and, by necessity, have a sharp eye for detail. I have a strong design focus, and believe that good design is crucial to the usability, accessibility and ultimate success of any application. I’m a regular attendee at industry meet ups and events including Codebar and LRUG and, when I’m not acquiring Code School badges, I like to read bad magazines and good books. Collecting languages is another pastime and I speak fluent Spanish, passable Mandarin and conversational French. 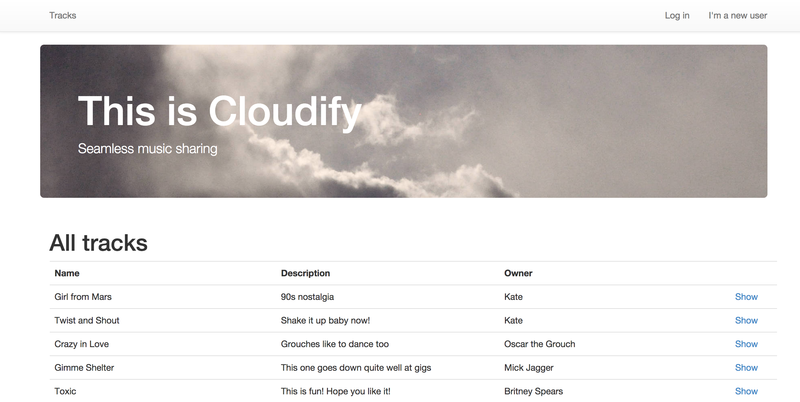 Cloudify was my very first Rails app, built after just 5 weeks of learning. The app allows users to share and listen to music and artwork and personalise their profile pages. It also allows commenting and comment moderation and uses a range of gems including Carrierwave, RMagick, CanCanCan and Acts as Commentable. Drinkfindr was the third project I produced at General Assembly. I wanted to create an app that makes it incredibly simple to find bar recommendations from people you trust. Its clean styling cuts through all the noise of social media when searching for venues to show only reviews from people you nominate. 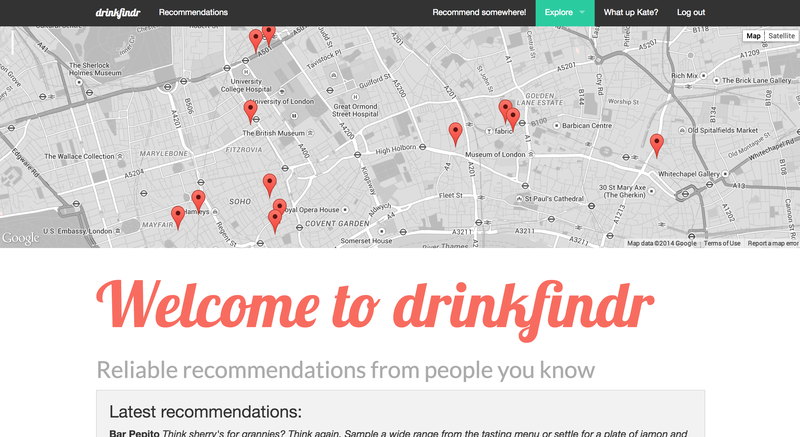 drinkfindr is a Rails app that uses the Google Places API and Geocoder to help users make short recommendations quickly and easily via a responsive interface. Go to drinkfindr.herokuapp.com to try it out!